It’s time to leave Morocco’s cities behind. Marrakesh and Fez, Essaouira and Casablanca have been fascinating introductions to the North African country. But, during your first two trips, you kept wondering what was hiding in the Atlas Mountains, which separates the coasts—the Atlantic Ocean and the Mediterranean Sea—from the Sahara desert. Third time’s a charm, as they say. 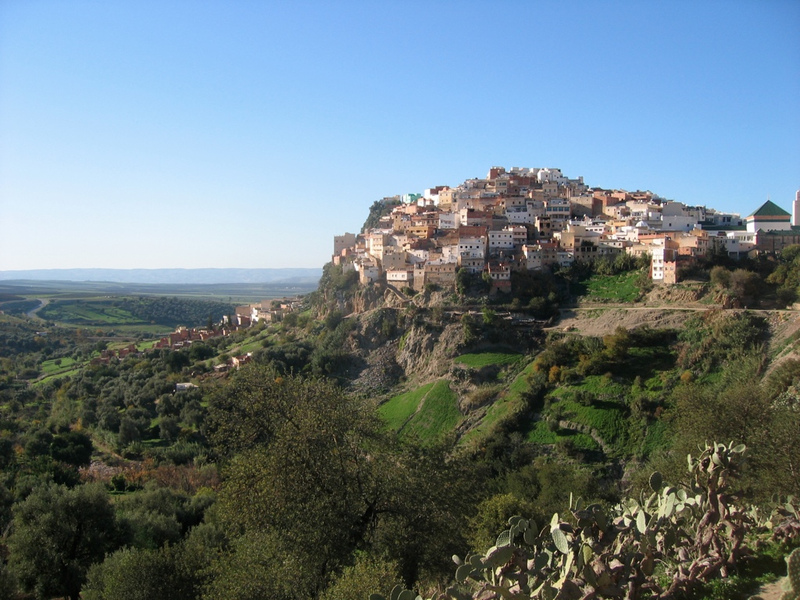 From the distance, Moulay Idriss looks like an Italian hillside town. It’s narrow streets, built for donkeys, are lined with whitewashed houses. Cafes surround the main square. The view extends over olive groves and into the Saiss Valley. While thermal baths and the ruins of the Roman city of Volubilis are just outside of town. But there’s a lot more to Moulay Idriss than meets the eye. When you start walking through town, at the base of Mount Zerhoun, the Italian vibe quickly dissipates. Mosques stand in between some of the houses. There’s a souk, where everything from homemade rosewater to chameleons to kefta grilled over hot coals is sold. Plus the scent of burning olive wood floats into the streets from the hammam. It’s one of the holiest places in Morocco. Moulay Idriss was founded by Idriss I. He was a descendant of the Prophet Muhammad, the founder of the Idrisid dynasty, and the person credited with bringing Islam to Morocco. The Mausoleum of Idriss I, where he’s buried, is one of the most sacred spots in the country. It has a green-tiled roof, prayer halls, and tombs. It’s only open to Muslims, though. The nearby Moulay Idriss Medersa has the only round minaret in the country. More green tiles, marked with Quranic script, encircle it. Until 2005, non-Muslims had to leave Moulay Idriss before darkness fell. Visitors are now welcome to stay overnight, eat dinner on rooftop terraces, and watch the sun set into the valley. That’s how you end up being welcomed by a Kiwi at Dar Zerhoune. The small guesthouse is in a modest building just off the main square. It has wooden beams, tiled floors, and classic keyhole-shaped doors throughout. There’s a central courtyard and small balconies, as well. But the rooftop restaurant is the real draw. Breakfast features couscous bread, and local olive oil and honey. Mint tea is offered in the afternoon. 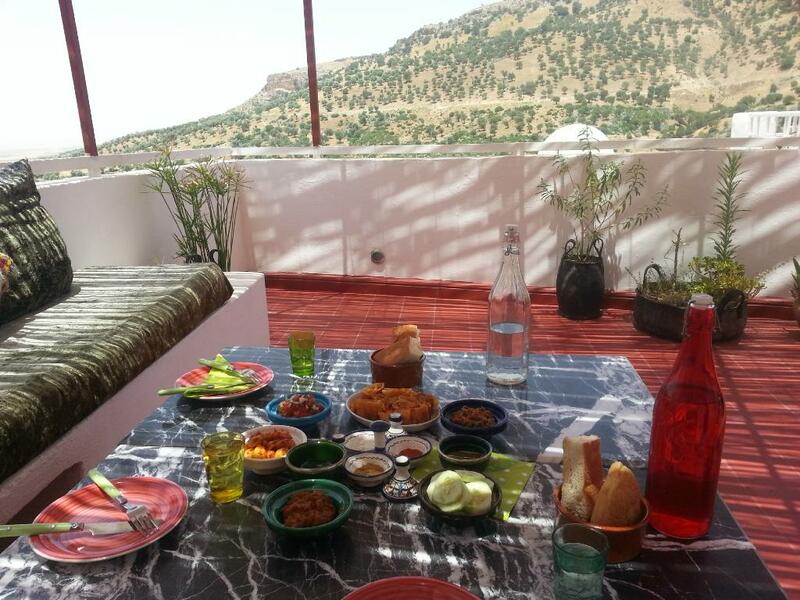 While salads, soups, tagines, and lots of fresh vegetables are served at the end of the day. Add a view of Volubilis, the former Roman capital that’s now a UNESCO World Heritage Site, for an evening you’d be unable to replicate in any of the cities.